Holiday Daycare at Como Park: Big fun for little monkeys. Shopping or no shopping, things get a little kooky-busy this time of year. If only you could have, say, 4 1/2 hours to get a few things done, then maybe the holidays wouldn’t be so filled with frazzle. Enter: “Holiday Daycare” from Como Park Zoo & Conservatory. No, your kiddos won’t be babysat by a gorilla (as cool as that sounds). Instead, drop them off (ages 3 and up and potty-trained) to be cared for by responsible adult humans who will keep them safe and occupied for 4 1/2 fun-filled hours. 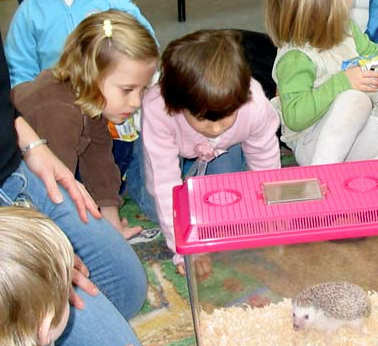 With activities like: a scavenger hunt through the Zoo and Conservatory, special animal visitors, plus, games, crafts and other wild zoo-themed fun. There are three different dates available with a Black-Friday option if that’s your kind of crazy thing. The idea being that while the kids are occupied, you have time to play Santa. But I won’t tell if you just stay home and take a big ol’ nap to rest up for all of the holiday family togetherness that lies ahead. Cost is $35 per child and family discounts are available. Space is limited and pre-registration is required. Pack a lunch and snack that doesn’t need to be refrigerated or heated. For more information and to register, call 651-487-8272. You’ve got 4 1/2 hours. Go wild. Amy Hernandez may not know a lot about land use and transportation issues, but she does know a few cool things to do with kids in the Twin Cities. A freelance copywriter, she lives in Northeast Minneapolis with one amazing boy, a saintly husband, and a hyperactive Border Collie mix named Chewie.